C. Greg Harper is President, CEO and director of Spectra Energy Corp.
HOUSTON, TX, Dec. 17, 2007 – Two of the country’s leading corporate professionals headlined the Fall 2007 Commencement ceremonies for the C.T. Bauer College of Business. Spectra Energy Partners, LP, president, CEO and director C. Greg Harper gave the keynote address for MBA graduates on Dec. 14, and Administaff president Richard G. Rawson spoke to undergraduates on Dec. 15. Both Harper and Rawson are members of the newly formed Dean’s Executive Board at Bauer College and are also alumni of the college. 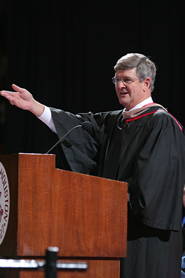 Harper received his MBA with honors in 1997, while Rawson received a bachelor’s degree in finance in 1972. “We strive to teach the importance of excelling in the corporate world while implementing the values of excellence and innovation that we encourage in all our students – our two speakers exemplify our mission,” Warga added. Harper commended graduates for successfully balancing their schoolwork with careers and for committing themselves to the corporate world. “Business is a calling. Business has enlightened and energized our world every day. It is bright, inquisitive men and women like all of you that bring great ideas to market so they can make a larger impact on our worldwide economy,” he said. Rawson similarly focused on leadership in his address to undergraduates, which he titled “Leadership: From the Classroom to the Boardroom.” In his speech, he detailed the four characteristics of a leader – someone who can set a goal, be passionately committed to that goal, maintain a positive mental attitude all the time and carry themselves with honesty and integrity. C. Greg Harper is President, CEO and director of Spectra Energy Partners, LP, one of North America’s premier natural gas infrastructure companies serving three key links in the natural gas value chain: gathering and processing, transmission, and storage and distribution. He began his career with the company in 1987 and was named to his current position in 2006. Harper is a member of the National Energy Services Association and is on the boards of Houston’s Theatre Under the Stars and the University of Houston’s Global Energy Management Institute at Bauer College. He earned a bachelor’s degree in mechanical engineering in 1987 from the University of Kentucky. He also received a master of business administration degree from Bauer and later complete Rice University’s Executive Development program. Richard G. Rawson is President of Administaff, Inc., the nation’s leading professional employer organization, serving as a full-service human resources department for small and medium-sized businesses throughout the United States. He has been a director of the company since 1989 and president since 2003. Before being elected president, he served as executive vice president of administration, chief financial officer and treasurer of the company from 1997 until 2003. He previously also served the National Association of Professional Employer Organizations (NAPEO) as president, first vice president, second vice president and treasurer. In addition, he served as chairman of the accounting practices committee of NAPEO for five years. Rawson has a bachelor’s degree in finance from Bauer College.